Whinberries hand picked from our local hills! The Stiperstones Inn is world famous for its Whinberry Pie and Whinberry Crumble! As well as being delicious to eat the fruit is renown for its antioxidants and their remedial properties. Whinberries are also known as bilberries, blaeberries, wortleberries and huckleberries (in a few areas). Whinberry has long been a remedy for poor vision and "night blindness." Clinical tests confirm that given orally it improves visual accuracy in healthy people, and can help those with eye diseases such as pigmentosa, retinitis, glaucoma, and myopia. During World War II, British Royal Air Force pilots ate Whinberry preserves before night missions as an aid to night vision. Whinberry works by improving the microcirculation and regeneration of retinal purple, a substance required for good eyesight. Dried Whinberry fruit and Whinberry tea have been used as a treatment for diarrhoea and as a relief for nausea and indigestion. Whinberry is also used as a treatment for mild inflammation of the mucous membranes of the mouth and throat. The leaves and berries are used in the homeopathic treatment of diabetes. 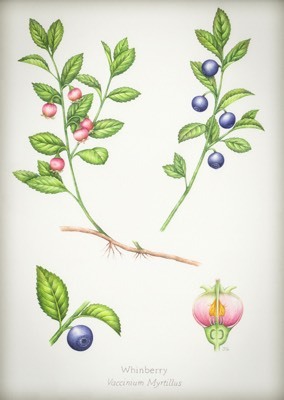 Whinberries are used in making jams, preserves, liqueurs, and wines. Stiperstones Holidays are not the same without a day spent picking Whinberries in the National Nature Reserve. The Stiperstones Inn’s Homemade Whinberry Jam, all year round. See our other jam flavours here.